Craig Tapscott: When you’ve been able to amass a huge stack at your table, what are some of the creative ways you can take advantage of your stack in regards to putting pressure on your opponents? David Baker: Proficient big stack play is essential to tournament success. As the depth of your stack increases in no-limit hold’em, the decisions become increasingly complex. These decisions are highly dependent on your opponents and their effective stack sizes. For example, one mistake some novice players make while being short-to-medium stacked is being too afraid of the big stack. Their mantra is often “he has so much he’ll just call me with anything if I shove.” They then set a threshold of hands that they are willing to battle you with, often disregarding position. These players are great targets for steals regardless of your stack size, and you will get an extra boost in fold equity as your own stack increases. Many players will tighten up to the point that you can get away with a ridiculous frequency of steals, as their arbitrary range will almost always be too tight. Another type of weaker player knows enough to raise his middle strength hands in late position, but will never play back at you without a premium hand such as T-T plus, A-K. This type of player is one I will target for light three-betting, especially in position. He will fold a large percentage of his opening range, four-bet with his premiums, and almost never flat. When he does, it is almost always with a medium strength hand that will fold to one or two barrels unimproved on the right boards. Good players, however, will not make all of these mistakes. They will recognize when your stealing frequency increases and increase their re-stealing frequency. In these situations, it is all about which player can adjust best. On the bubble of something like a WSOP $1,000 event, I might have three players behind who will fold all but about 8 percent of hands or even tighter. The one person in my way is another thinking player. If he has only 15 big blinds, he will be mostly shoving over my opens. If he gets into the 30 big blinds range, I will expect him to incorporate some light three-betting and flatting. The specifics of my range vary by position and table condition, but I will say that I will tend to put chips in the pot against such a player if the situation seems very close. I also think many players who know me will expect me to play at least a bit looser when on a big stack; I usually try to have the goods against such players as they seem to always think I’m bluffing. Benjamin Palmer: It’s a sick advantage to have the big stack because it gives you the flexibility to apply constant pressure to your opponents. When you don’t have chips you are handcuffed into playing more of an ABC style of play. But when you have the big stack you can three-bet and four-bet the smaller stacks at your table and constantly put pressure on them. This puts them to tough decisions for their stack, while in turn only risking a small portion of yours. When you have a big stack, you have the advantage of being able to play more hands and build an image that will help you get paid on your big hands. Alex Keating: When you are playing against weak players and a pay jump is coming up, sometimes you can sense that they are waiting for the next pay bracket before putting their stack at risk. This is a good time to use your big stack to bully them. Any time you have a table that doesn’t give you resistance and doesn’t adjust to how often you’re raising is a great time to take advantage of your chip position. In addition, bluffing on the river gains a lot of value in these spots against other big (but not as big) stacks. Mainly because often times someone will call a flop and turn bets from you, because they think you’ll shut down on the river. A lot of people will call a turn bet with anything reasonable for the lure of two options: 1. They will improve to a better hand, 2. Their opponent shuts down a bluff. It’s really tough for an opponent to call off an amassed chip stack on the river, especially in a tournament where there are a lot of better spots. It certainly changes a lot depending on the player and the dynamic. I wouldn’t suggest this play every time, but it’s a spot that generally gets a lot of folds, and it’s a good way to employ the big stack. Craig Tapscott: What are some mistakes players who have the big stack make that you would consider big leaks? 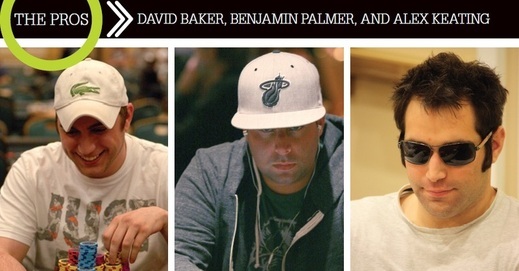 David Baker: A big mistake I see players make while holding a big stack is overextending themselves. They try to gamble too much and in the process lose their hard-earned chips. Some people play as if their big stack is a free ticket to go crazy and start shoveling chips into the pot without regard for their opponent’s stack size. Nits get hands too! If you start a four, five, or six-betting war with another deep-stacked player at the table, make sure it is the right player and situation. However, I also think that some people have a tendency to get too complacent after they get reraised a few times with a big stack. They back off from steal spots, because the action was pushed the last two attempts. If your button steals are getting picked off, move to another position where players may give you more credit. Perhaps wait for an orbit and then three-bet from a classically strong position versus a wide opener instead of stealing. Mixing up your bluffs and keeping your opponents on their toes rather than staying with one strategy is the key to fooling observant players at the poker table, especially as a big stack. Benjamin Palmer: It’s important to know when to apply the pressure, but sometimes you’ve got to slow down. Some tables aren’t going to let you run them over. If you get caught bluffing a few times you should probably tighten up for a few orbits. I think another mistake is calling shoves too light, especially versus the more solid opponents. Just because you are playing lots of hands doesn’t mean everybody at the table is shoving on you light. It can be easy to get caught up in the moment and we’ve all had that happen. You’re running well all day and can’t help but make a bad call or two. What it comes down to is that it’s important to maintain your focus when you have the big stack and make the correct play in each situation.